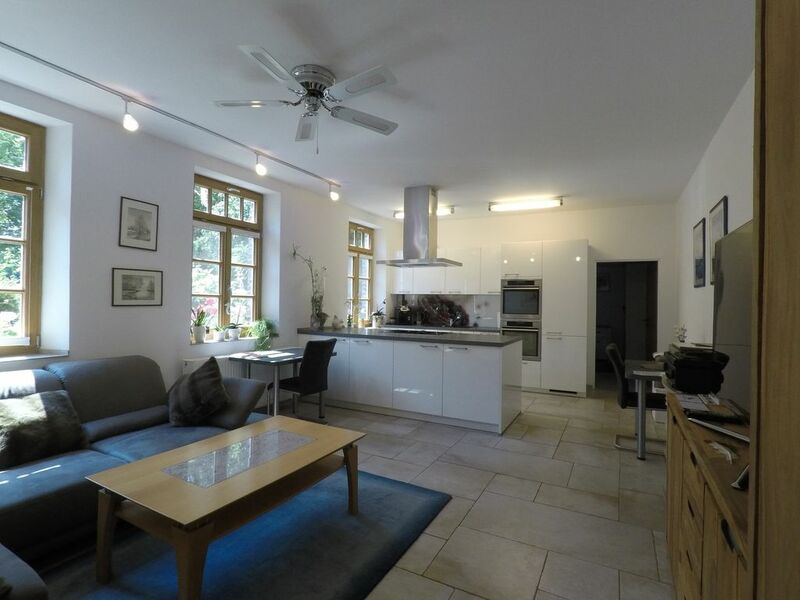 The Non smoking apartment with private entrance is located on the ground floor of a listed farm and consists of a living-dining room with open kitchen. In the fully equipped kitchen is next to the oven and the induction cooktop also a steamer, including "Sous-vide" -Garfunktion and other automatic programs. For your luggage in the bedroom and living room several cabinets are available. You will also find in the living room a large flat-screen TV and a stereo including a turntable. The water bed with a length of 2m also allows larger people to restful sleep, also located in the bedroom, a second large flat-screen TV and in addition to the air conditioning, a ceiling fan. The fold-out cot has a lying surface of 120x60cm and is suitable up to 15kg. The bathroom has a walk-in shower and bath. Everything is heated by central heating. In addition, there is air conditioning in the apartment as well as pleated blinds and insect screens on the windows, so that you can recover at optimum room temperatures throughout the year, both in summer and in winter. Grefrath is surrounded by greenery, in the beautiful nature park Schwalm - Nette, with its dense forests, river meadows, heath landscapes and lakes. Grefrath offers both as a starting point, but also as a stopover for hikers and cyclists. Alone 13 designated hiking trails and some cycle paths lead over 70 km through the Grefrather Niersauen. In addition, paddling on the Niers has become a real tourist attraction. You should not miss a visit to the Niederrheinisches Freilichtmuseum. The price is for 2 persons per night. Fantastisch huis. Werkelijk grandioze keuken met alles erop en eraan. Servies voor misschien wel 10 personen. Badkamer helemaal oké. Ruim bad en goede douche. Waterbed helemaal ons ding, hebben er zelf ook een maar dan niet gestabiliseerd. Ook de tv en geluidsinstallatie was prima. Leuk om weer eens een LP te draaien. Zeer vriendelijke mensen. Leuke aangelegde tuin bij het huis. Enig minpuntje wat wij kunnen verzinnen is dat als je er lange tijd vakantie wil houden een tuin voor jezelf een wens zou kunnen zijn, vooral in de zomer als je de barbecue wil gebruiken. Voor een paar dagen is dit een grandioos huis. Superschicke Wohnung, top ausgestattet (u.a. Wasserbett und Toilette mit integriertem Bidet), Hunde erlaubt. Wir hatten leider nur für eine Übernachtung Zeit, aber die haben wir sehr genossen. Der Sturmhof liegt etwas außerhalb. Für uns und unseren Seniorhund war das kein Problem. Wer länger dort Urlaub machen möchte, sollte sich Fahrräder mitnehmen. Die Wohnung umfasst alles, was man braucht, um sich komplett gut versorgt zu fühlen! Ruhige Lage und hilfsbereite Gastgeber inclusive. bei so unkomplizierten und netten Besuchern ist es ein Vergnügen sie bei uns als Gäste willkommen zu heißen. absolut hochwertig ausgestattete unterkunft in traumlage welche seines gleichen sucht. lässt keinen vergleich zu. einfach top! sehr gerne wieder. Ich bedanke mich sehr für die tolle Bewertung! Hoffentlich sehen wir uns bald einmal wieder, ihr seid sehr nette Mieter. Eure Vierbeiner sind absolut gut erzogen! Grefrath is surrounded by greenery, in the beautiful nature park Schwalm - Nette, with its dense forests, river meadows, heath landscapes and lakes. Grefrath offers both as a starting point, but also as a stopover for hikers and cyclists. Alone 13 designated hiking trails and some cycle paths lead over 70 km through the Grefrather Niersauen. In addition, paddling on the Niers has become a real tourist attraction. You should not miss a visit to the Niederrheinisches Freilichtmuseum or, depending on the season, a round on the ice of the 400m long outer ring in the Grefrather IceSport & EventPark.